Well this has been beautifully designed keeping simplicity in mind. 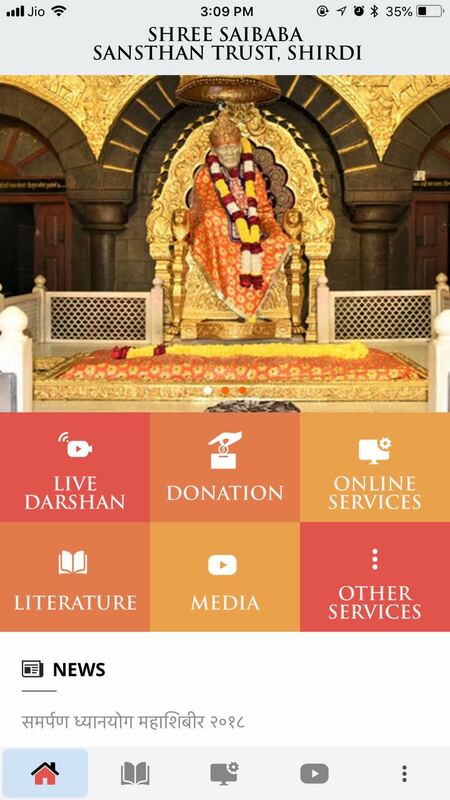 As the name suggests this tab will redirect to live streaming direct from Samadhi Mandir, Shirdi. 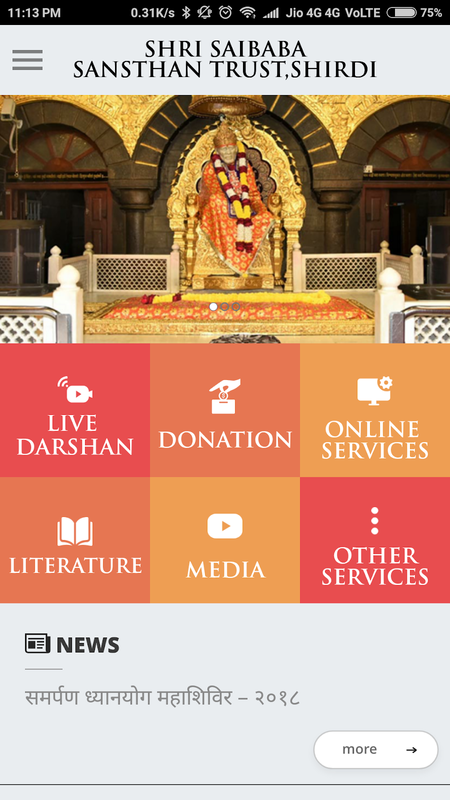 This is the best feature of the app as only official app by Sansthan can give this add-on of live darshan directly from mobile. Though there were few such apps in google play (havent researched all) but they were not so flawless like this one. Now its easy to attend arti directly from mobile from anywhere. You can keep alarm on your phone and start app at arti timings. One can give online donation, on tapping this tab, it will redirect to online.sai.org.in in your phone's browser. After successful registration, under this tab you will be required to fill up a survey form. This tab has three sub headings: [line] Sai Satcharitra: Sai Satcharitra in all languages that are published by Sanshtan are uploaded here. However to read it you will to download it first and you will also have to install any PDF document reader app as the downloaded text will open as PDF document after downloading. - Gujarati [line] Aarti: All aartis are listed in this tab for download. An inbuilt media player will play arti as well. - Shej Aarti [line] Sai Leela: This an interesting and useful tab where ALL Sai Leela Magazines are uploaded right from 1923 till 2017. However you will need PDF reader app to access downloaded files in the Sansthan App itself. Kindly excuse me for not sharing screenshots as somehow they were not working in my phone. This tab provides information and schedule about Centenary events from May to October 2018. Invitations for major festivals like Ramnavami, Gurupurnima and Punyatithi are uploaded here from the year 2010. Everything opens here in app only so it is very easy to navigate and get information. This tab provides detailed information about Sansthan, Shirdi Tourism, Tender/Quotations, RTI. It also provides a contact us wherein email id's of various dignitaries of the Sansthan are provided department wise along with postal address, phone numbers, common email id and website links. You can change your password, log out and view your profile from this tab itself. You can also refer to detailed terms and conditions. Latest news and about festival is given in this tab. [line]Disclaimer: The views and opinions are mine and can be different from user's experience in actual. Thank you babaji for your blessings. Please be with us always.